Since most of the GTB's readership are DC natives or at the very least, long-term imports, we thought you would enjoy the story of Metro bus driver Shawn Brim and his very bad idea. On Saturday, while driving his bus downtown, Brim came upon McGruff the Crime Dog handing out fliers about crime prevention to children on the street. 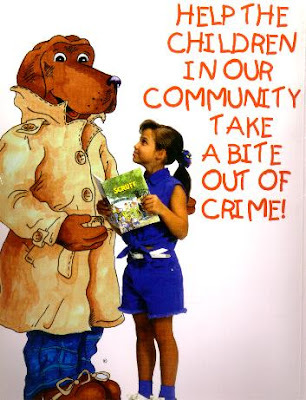 Brim stopped, walked off the bus, adjusted his side view mirrors...and punched McGruff in the face, terrifying the group of children who had stopped to meet the famous anti-crime advocate and learn how they could take a bite out of crime (and deal with bullies). Brim then got back on his bus and drove away. He later told his supervisor that he had chosen to beat up McGruff simply because he thought it would be funny. Brim is undergoing drug and alcohol testing, and his continued employment with Metro is...to be determined. Let's tell the truth, who amongst us hasn't thought about punching McGruff the Crime Dog? With his trenchcoat and his life lessons, he is utterly punchable, but that's where the fantasy has to end. You don't actually do it and if you are going to do it, wait until you get off work. Not a sermon, just a thought. At least he didn't run over him with the bus. That's kind of where I thought the story was going.